Jean-Claude Monney is a seasoned executive and leader in the knowledge management and digital transformation space, as well as a teacher, speaker and digital transformation coach. In our interview below, he discusses what first introduced him to change management, how he’s seen the discipline influence the business world, and where he sees it going. Jean-Claude had his "aha" moment when he realized that the organization doesn’t change, but the people within the organization change. 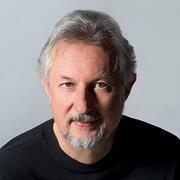 He made ACM - Adoption and Change Management - the program, not a line item on the program. If you approach change management as an afterthought on a project, it's not going to work. Having a clear measurable business objective - really understanding the why behind the change - is critical; then you can apply the ADKAR Model and start with awareness with a crystal-clear message. When deciding who you need to be on-board, go to both the senior leadership team and the first-line managers. We need to bring change management education earlier to leaders. In a world that is moving to agile as a business strategy, the ADKAR Model as an individual change model is necessary, giving that last mile that makes or breaks the whole program. Simply put, the difference change management can make is the difference between success and failure. First, tell me more about who you are and the work that you're doing. Until last July, I was the Chief Knowledge Officer at Microsoft Services, the largest division of Microsoft with 23,000 people. My role was to lead a digital workplace transformation about how we can apply collective knowledge to create a higher value for our customers, our partners and our employees. I’ve just retired after 41 years in the industry so that I can pursue a new career as a teacher, speaker and digital transformation coach. In addition to providing keynote speeches at industry and internal customer events, I recently accepted a faculty position at Columbia University, where I teach Digital Transformation for the Master of Science in Information and Knowledge Strategy program. When did you first encounter change management? I was exposed to change management quite early on. I spent half of my career in an IT role and half in a business role. Which was quite interesting because I could see both sides: first I was the user of IT, and then I was the driver of IT. The first digital workplace transformation I led was in 2001, when I was in an IT role and had to launch the global intranet of the company. There were 52,000 employees, and the question was, how do I do that? The answer at the time was John Kotter. So, I knew change management was something I had to deal with, and I really tried to implement it. But it was not easy. Did you have an “aha” moment with change management, where you really saw its importance? That made you the advocate for change management that you are today? I had my "aha" moment when I realized that the organization doesn’t change, but the people within the organization change. Suddenly change management had something that was useful to me. That was in 2011 during a presentation on the ADKAR Model at Microsoft. I was just fascinated by this idea of the people side of change and the practicality of the ADKAR Model. How did you start bringing change management more into your work? I had several opportunities when in charge of major transformation programs. First in 2000 when with my team we drove the company-wide e-Business transformation for STMicroelectronics, then in 2007 when we created a 7,000-person joint venture between Intel and ST, and finally in my former role as Chief Knowledge Officer when I joined the Microsoft Services Office of the CTO. At the time, the cloud was the big topic so I decided we needed to re-imagine our knowledge collaboration platform on the cloud and make this a showcase for Microsoft. The CTO was on board and sponsored the project, and we agreed that we would build this using the Microsoft Office 365 cloud platform. But we did not have any large-scale examples to learn from, so the big question was, "How am I going to do this?" It was an obvious change management challenge and I brought change management into the transformation in three ways. First, I built change management capability into my team. I hired a person who became Prosci-certified to be the Program Manager for our team, who would then lead the program for knowledge management worldwide for all Microsoft Services. And my statement, which I use quite often, is that, "I make ACM - Adoption and Change Management - the program, not a line item on the program." This is fundamental. If you approach change management as an afterthought on a project, it's not going to work. Adoption and Change Management is the program. Second was to integrate change management with project management of the new cloud-based collaboration platform. We partnered with the existing Microsoft Services Adoption and Change Management consulting team to ensure we would apply best ACM practices. The ACM consulting team had licensed the Prosci methodology, so they were the source of knowledge for us on change management. Were your sponsors on board with this shift to “change management is the program, not just a line item”? That was the second thing we needed to do: to convince our senior leadership team that previous change approaches failed, and we needed a different approach. We presented the ADKAR model, and the senior leadership team was all in, thanks to our KM program sponsor. They agreed to be sponsors of the program and ensure clear accountability in their respective organizations as well as ensuring global communications of the need for change. What was the third way you brought in change management? Lastly, we partnered with the business owners so that we had a clear business outcome that we wanted to achieve. The project was about institutionalizing the re-use of knowledge to scale innovation, improve competitiveness and operations efficiencies. Without this partnership, without the why, we get into this situation: The project team has a road map, a launch plan, and training scheduled for the week of the launch. But the people who receive the training have no idea what's going on. They try to avoid spending the time in training because they are pressured to do other things. They try to game the system because they like the old way of working. They are more comfortable with the old way. It’s a human nature to resist change. Having a clear business objective - really understanding the why behind the change - it's so important. Then we can apply the ADKAR Model. The most important thing we need to do is to start with the first letter "A" there, awareness, and have a crystal-clear message. Was that last part, talking about the "why,” your turning point, where you really saw the program gain momentum? Yes. The turning point was when the Adoption and Change Management team convinced our sponsor to go that route – of starting with the why, using the ADKAR Model – and then supporting the execution of it. So, we got the sponsors on board. We also did a very interesting exercise with first-line, or frontline, managers. We invited people managers to an optional four-hour presentation/workshop where we explained the why, what and how of the project and went through the ADKAR Model. We collected valuable feedback for improving our communications and in particular the WIIFM (What’s In It For Me) as we know that change will happen when people embrace that change. This is where I saw the greatest change. It's great to have the sponsorship, but the biggest change is when your employee’s direct manager is committed to the change. They are the representative of the culture of the company. What were some of the results that came out of this project? There were three types of results. One was a higher level of engagement with people for the program. We were treating people differently. So that was the first thing. Working this program, through the ADKAR Model, gave us a higher degree of engagement. Number two is that our impacted employees discovered the "WIIFM." If you do your job with change management right, the "WIIFM" becomes real. And therefore, people not only understand why they need to change, but they see the overall benefits of the change, for them and for the organization. The third result was the business goals that we were expecting. People were embracing knowledge reuse best practices as part of their daily work. By institutionalizing the reuse of knowledge, we lowered the risk, improved predictability and quality while reducing the risk reserve. So there is a very clear relationship between the intent of the change and the expected value outcomes. You’ve also continued to work as a thought leader and advocate for change management (among other things). Has your change management focus shifted over time? 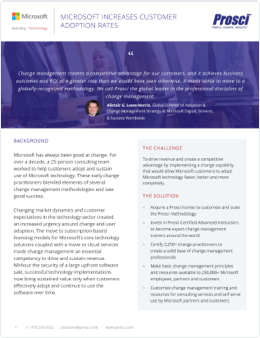 When I started sharing with customers and the industry at large on how we did knowledge management at Microsoft Services, I had a section on Adoption and Change Management. When a Microsoft person goes to visit a customer, they expect that person to talk technology. And I spent 80% of my time not talking about technology because that is not the biggest problem. It's the people and the culture. So, I was a natural advocate of Adoption and Change Management through my speaking and sharing since I spoke to more than 100 customers in the last two and a half years and gave keynotes at major events. When I joined Columbia University earlier this year and started building my Digital Transformation course, I knew I was very intentional to include the individual aspect of change. I was very fortunate that Tim Creasey from Prosci accepted my invitation to present to my students, and it was one of the best lectures of the course. People gave us feedback on how this would forever change the way they worked as professionals. I wish that change management had been a leadership discipline when I did my studies. When you look at the manager capabilities today, you expect a manager to know about the basics of HR management, about P&L, some basic marketing stuff. Why is change management not there? We need to bring education earlier to leaders, and this is one of my key motivations to be a teacher. My role, as a thought leader, is to advocate for change management and knowledge management in higher education and help transform higher education. Where do you see change management going? Where do you hope it would go? As I said, I started with Kotter, and I think the fundamentals are still valid. But when the rubber hits the road, it's the last part, the last mile, we didn't have a proven method for. The ADKAR Model gives that last mile that makes or breaks (when you don’t use it) the whole program. In a world that is moving to agile as a business strategy, not agile only in the software sense, an individual change model is mandatory. I think agility is going to be fundamental in what we do. And the ADKAR Model is well suited to support the agility movement and has good research behind it. That's where I think change management is going. First of all, it needs to be scaled far more. It needs to be understood far more. So, education is one. Then make the ADKAR Model an integral part of the agile movement. Continue to improve on my growth mindset to be a better teacher, speaker and coach. We need more education, both at academic institutions and inside corporations, and I’m grateful to Columbia for giving me that opportunity. Continue to advocate for ACM and KM through speaking engagements to raise awareness for these key organizational capabilities. Lastly, with the acceleration and the breath of digital technologies, I see an emerging new role that I call a Digital Transformation coach/mentor to assist leaders harnessing that digital challenge. The more I talk to executives or teams about how you approach digital transformation, and digital workplace, and how Adoption and Change Management is an integral part of that, the more I see that there is an appetite for this. Lastly, have fun, travel the world and give back. One more question about results: When you’re talking about the different that change management has made, what do you say? Well, simply put, it is the difference between success and failure. A couple of years ago, the Vice President of Technology at TSIA ran a study that found that half of knowledge management projects failed the first year, and two-thirds failed in the next two years. So, if you look at the amount of money that is being put into this, and the failure of it, it's a disaster. I had one project failure in my career. I'm not ashamed of it because my team and I did our best, but it did not work out. It was a company-wide CRM project. We failed because we asked the sales people to use the CRM system so that the management would have greater visibility. But the management refused to use the system and were asking the sales people to provide data to them while these data were available on the CRM dashboard. So, no WIIFM! If I would have used the ADKAR Model on this project, we would have educated the middle management to institutionalize the change. And so, we failed. We failed to make the change and eventually the project had to be redone a couple of years later. That was a big lesson learned for me. That, and my experience with leading three global digital workplace transformations, has shaped my understanding of running global programs that focus on the people aspect of change. Changing market dynamics and customer expectations in the technology sector created an increased urgency around change and user adoption at Microsoft.